As the Waynesville Retail Merchants were planning to hold a sidewalk sale, it was suggested that a sauerkraut dinner be served as part of the event. With this decision, the Ohio Sauerkraut Festival was born. 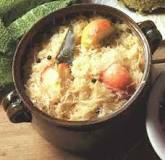 That fall, on October 3, 1970, Waynesville hosted its first Sauerkraut Festival, serving 528 pounds of sauerkraut to approximately 1500 visitors. Entertainment included an antique car parade. German bands and folk dancers, checkers and spelling bee contests, and of course, prizes for the largest head of cabbage and the best homemade sauerkraut. Booths were set up on Main Street to sell kraut-containing foods (including sauerkraut ice cream), fall harvest, produce, and display the antiques, arts, and crafts of a few vendors. Word of the high-quality food, entertainment, and crafts spread quickly and the Festival attracted crowds of approximately 4000 in 1971 and 10,000 in 1972, the size of the Sauerkraut Festival brought it under the management of the Waynesville Area Chamber of Commerce. The Festival continued to attract even-larger numbers of visitors, surpassing 40,000 in 1976. In the early 1980's the number of arts and crafts booths steadily increased, and the number of festival goers increased to an estimated 100,000 in 1982. Older than the state of Ohio, the Village of Waynesville offers a fascinating combination of history and culture as it developed in southwestern Ohio. This "Antique Capital of the Midwest" and "Home of the Ohio Sauerkraut Festival" is a microcosm of our American heritage with its dreams and accomplishments. Samuel Heighway founded Waynesville in 1797 and thought his town would become the capital of the Northwest Territory, a dream that never materialized. But Waynesville did grow up to be one of the most historically unique tourist spots in Southern Ohio. Heighway, an engineer from Shropshire, England, along with a small band of English frontiersmen settled Waynesville March 8, 1797. He and his partners, Rev. John Smith, a Methodist minister, Dr. Evan Beans, a physician, and Sir Francis Bailey, a young scientist invested in 30,000 acres in the Symmes Purchase between the Little and Great Miami Rivers. A plantation was their scheme. Heighway's initial layout of the village was on a rectangle plan. His design was that of an English village. Formal parks and squares were arranged around a central public square. A settlement party, organized at Philadelphia in September 1796, cleared land previously surveyed by Heighway as early as 1792. Over 10 tons of implements and supplies were bought at Baltimore and brought to Philadelphia. These were stowed aboard a 12 by 36 foot "Kentucky Ark" flatbed and moved on the Allegheny and Monongahela Rivers to the Ohio. After arriving at what is now the present site of Waynesville, the settlers dug in with primitive log shelters before log cabins were built facing the river. Heighway's initial layout of the village was on a rectangle plan. His design was that of an English village. Formal parks and squares were arranged around a central public square. These were accented with plans for a serpentine walk, groves of ornamental trees and fishponds. Heighway's original map of the village was dotted with fountains. A "Government House" was strategically situated on the public square accented by a tree shaded esplanade. A very unique piece of festival history belongs to Bailey's Concessions. For 48 years now, Bailey's Concessions has been one of the original vendors of the Ohio Sauerkraut Festival. 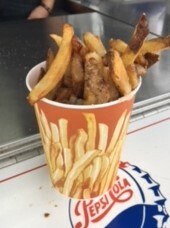 Having been here as long as the festival is old, Bailey's Concessions is grandfathered in under the current Festival Food Policy, and we are extremely lucky that Bailey's is still a part of our festival year after year. 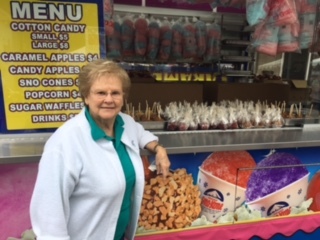 Today, run by Betty Bailey and her daughter Pat, these two concessions provide the festival food staples.... cotton candy, caramel apples, and french fries! Remembering back to 48 years ago, Betty recalls how her husband, Jim, was one of the leading voices, along with Albert "Capp" Stubbs in creating the Sauerkraut Festival. They had just a handful of vendors that first year, but year after year, they had a front row seat as the Sauerkraut Festival grew into what it is today. Their monumental support and desire to see it grow was key to those initial years. 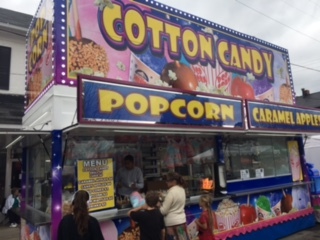 Currently, the festival houses almost 60 different food items, of which every other food items is sponsored by local non-profit organizations, such as the schools, churches, clubs, and athletics.